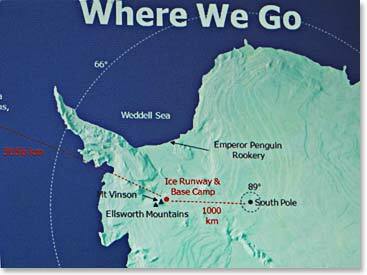 After years of dreaming, planning and preparation, the goal of John and Kate Gellert to visit the interior of the “ frozen continent”, Antarctica, and attempt to climb to the summit of 16,047 feet Mount Vinson under the leadership of Wally Berg is underway. This project has been referred to by John, Kate and Wally as “The Big Ice” from the beginning. 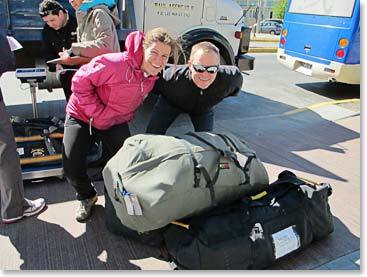 We arrived in Punta Arenas, Chile, on the Straits of Magellan, at the very tip of the continent of South America, our jumping off point of Antarctica on November 25th. From our hotel that looks out across the waters of the Straits towards the frozen wilds of the far south, we have been doing our last minute repacking and making our gear adjustments in preparations for our deployment by Russian Ilyushin jet to the Union Glacier at 80 degrees South, more than 1800 miles/3000 kilometres from here and 600 miles from the South Pole. We must be psychologically, mentally and logistically 100% prepared to arrive on “The Ice” once the conditions are right and we are cleared to be picked up, transported from our hotel to the airport where the Ilyushin and its Russian crew awaits. This is an exciting time and we will keep you posted with news about our steps toward the summit of Antarctica’s highest summit, our companions in adventure and the beauty and challenge that we find along the way. 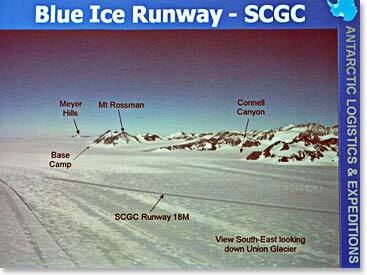 We are bound for The Blue Ice Runway at Union Glacier near the Ellsworth Mountains in Antarctica. 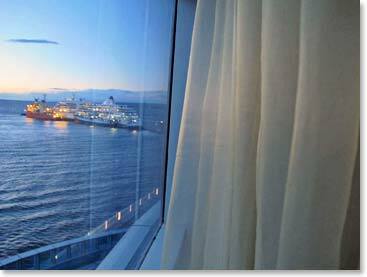 Here in Punta Arenas, our hotel looks out over the waters of the Straits of Magellan. 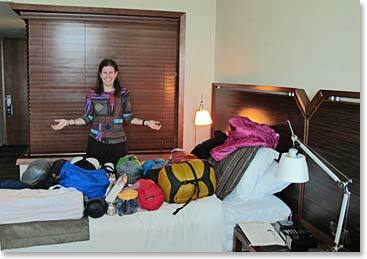 Kate is using her hotel room for last minute packing and organizing of her Antarctica gear. 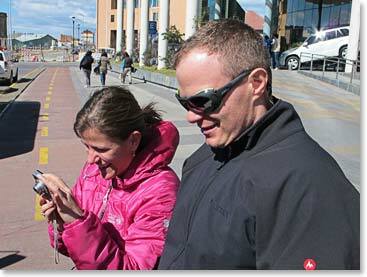 John and Kate photograph the southward bound equipment on the streets of Punta Arena. Our baggage was weighed before being taken to the airport and place in hold for the upcoming flight. 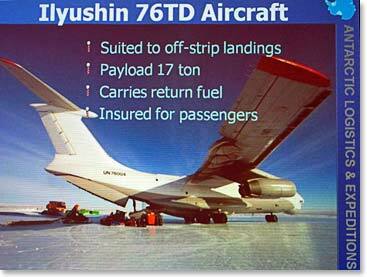 We will go south on and Ilyushin 76 jet. 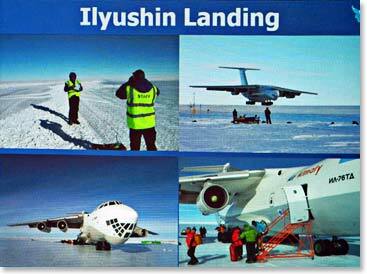 The landing on Blue Ice at nearly 80 degrees south will be spectacular and thrilling. Left: Here in Punta there is a tradition that Antarctic explorers kiss the foot of the native at the feet of Magellan in the statue in the town’s central plaza. John kissing the foot; Right: Kate also followed the tradition to demonstrate humility, and respect for tradition.